Visiting hours are from 9.00am to 9.00pm daily. Patient meal times are breakfast 7.30am, lunch 12.00 noon and dinner 6.00pm. After surgery it's generally best to give patients a few hours rest before you visit as they may be too tired to enjoy their time with you. Patients do sometimes request that visits and telephone calls be restricted for a period of time, so please don't be offended if we advise you accordingly. We love having children to visit but please remember that other patients may be sleeping and try to keep noise to a minimum. Please feel free to help yourself to complimentary tea, instant coffee and chilled drinking water in the patient lounge. We have a cafeteria called the Coffee Clinic in the main foyer on the ground floor, which is open 7:30 am to 3:30 pm Monday to Friday. Outside these times drinks and snacks are available from the food carousel in the main foyer. You may wish to purchase a meal at the hospital while you're visiting. A nurse or receptionist will be happy to order this for you. In most cases you will be able to choose from the menu or, if at late notice, there will be a standby meal available. If you are a support person for a patient, you may stay with the patient until they are ready to be taken to theatre. We will phone you when they are back in either day stay recovery or in the ward. 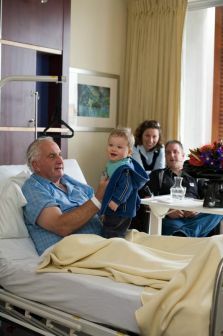 You are welcome to remain at the hospital while they are in surgery in one of our comfortable patient lounges. There is plenty of free car parking in the campus grounds. Grace is a non-smoking campus so please refrain from smoking in the hospital or on the grounds.